On the Third Day of Christmas my True Love Made for Me….Monster Cookies, Rice Krispie Treats, Homemade Hot Chocolate & more! The holidays are upon us and that means the kids are home from school. We have compiled a list of some of our favorite holiday treats that are super simple, fun for the kids and healthy, too! Love Monster Cookies but not all of the fat and calories that typically come with them? This healthy alternative will leave your kid's sweet tooth satisfied and you happy knowing they are not full of sugar! 1. (Pictured above!) Preheat oven to 350 degrees. 2. Line a baking pan with parchment paper, or foil sprayed with cooking spray. 3. In a medium bowl, combine everything except for the m&m’s. Mix until thoroughly combined. 4. Roll dough into even size balls, and flatten into cookie shaped disks (they will not spread). 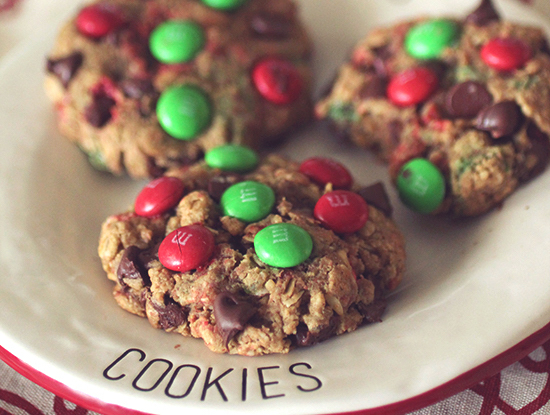 Add 40 calories to each cookie if you want to add the chocolate chips and M&M's. Or add 20 calories to each cookie if you want to add just one of these. 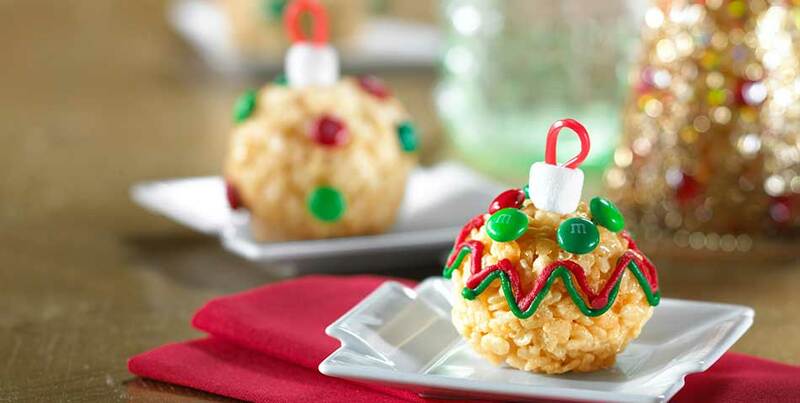 These festive ornament treats are a great activity for a child's holiday party. You can even make the ornament shapes ahead of time and let the kids enjoy being creative with their decorations! 1. Fold each licorice piece in half and push ends through centers of 12 miniature marshmallows. It may be easier to poke hole with a toothpick first. Set aside. 3. Using 1/2-cup measuring cup coated with cooking spray divide warm cereal mixture into 12 portions. Using buttered hands shape each portion into ornament shape around licorice ends. Cool. Decorate with frosting and M&M'S® chocolate candies or your favorite holiday candy. Best if served the same day. 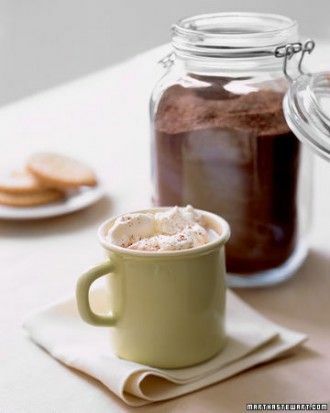 Hot Chocolate is an easy holiday staple for any household! This simple recipe is not only all natural, but also economical compared to store-bought mixes. Skim milk will make this recipe healthier but feel free to use your favorite kind! Don't forget to add in calories from the milk you choose to mix with! Skim milk will add about 80 calories, 12 carbs, and 8 grams of protein! 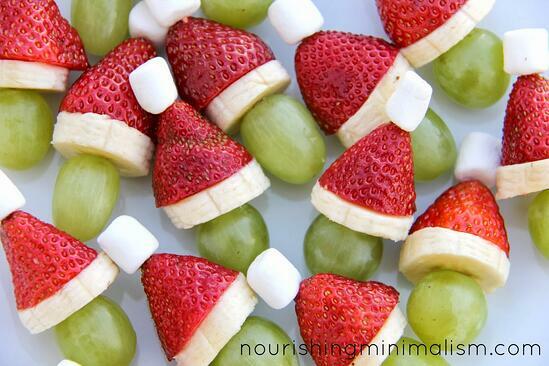 These Grinch fruit kabobs are super simple to throw together for your next holiday gathering. Kids can easily help create the treats and they are fun to eat too! 1. Wash grapes and strawberries. 2. Slice bananas and cut of the green end of the strawberries. 3. Poke a toothpick into the top of the grape, thread on a banana slice, then the strawberry top, followed by the mini marshmallow. White Chocolate and peppermint make a fabulous and festive holiday duo. Kids will love the hands-on (and slightly messy!) recipe crushing peppermints and drizzling chocolate. The only hard part is waiting on the chocolate to set! 1. Slowly melt white chocolate or almond bark in the microwave or on stove-top with double boiler. Stir often to keep chocolate from burning. 2. Crush peppermints and stir 1/2 cup of them into the white chocolate. 3. Place popped corn into a large bowl. 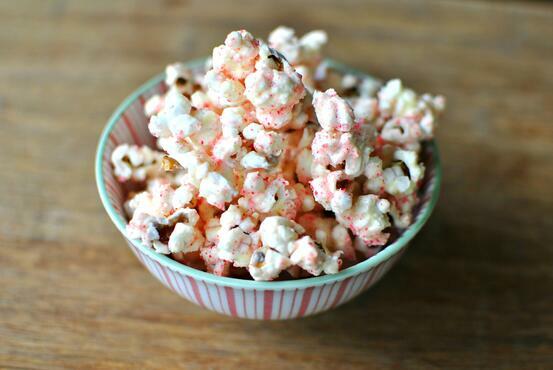 Pour melted white chocolate and peppermint mixture over the popcorn. 4. Gently stir to coat popcorn while sprinkling remaining crushed peppermints over the popcorn. 5. Pour out onto parchment paper and cookie sheet and allow coating to harden. Popping cookie sheet in the refrigerator for 15 minutes will help it set faster.